Finally spring is here. Time to celebrate! WATCH OUT FOR HATCHLINGS IN DOUG FLUHRER PARK – TIS THE SEASON! Last April we saw a couple of dead hatchlings on the Wellington St. right-of-way and on the trail in Doug Fluhrer Park. When it is starting to get warm they come out from overwintering underground. Do keep your eyes open. The hatchlings are the size of a quarter and will be struggling to reach the shoreline. If you see one, take a pic if you can and do contact harbourturtles@gmail.com. Almost hard to remember that earlier this month the shoreline was frozen. 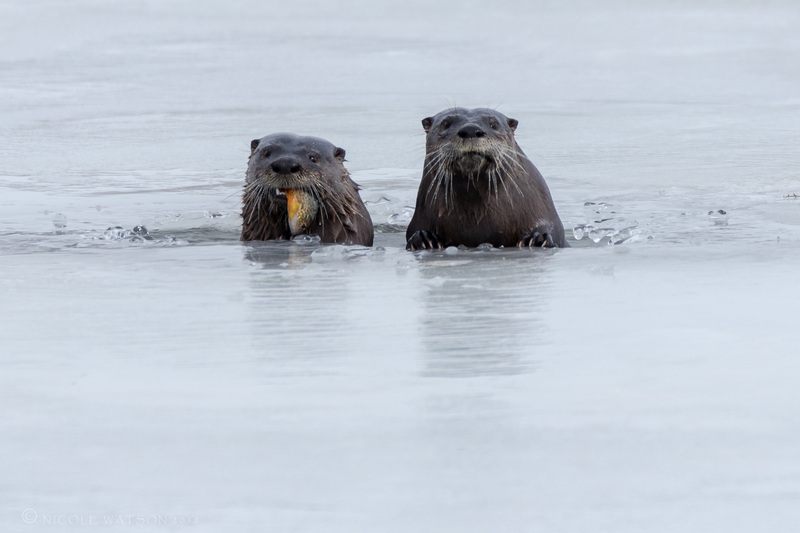 Nicole Watson’s great pic of Inner Harbour Otters taken right off the shore at the Woolen Mill. April 4! 1) Update on April 17 meeting re 9 North St.
8) IMPORTANT TURTLE INFO MEETING for all interested – Thurs, May 10. 15) Those large leafed trees along the trail near Quattrocchi’s? 16) Fun terminology info: Pier, Wharf, Jetty, Quay or Breakwater Groyne? 23) This could be our turtle theme song! On another note, I am inquiring with the city about the basic lack of disability parking in the park and the problem with the pathway down from North St being steep for wheelchairs. Again stay tuned…..
What: As part of Kingston Gets Active Month, this event is in partnership with the Skeleton Park Arts Festival and CaIvary United Church. It is not only for children and youth, but for all ages to get outside and play! Feel free to share with other community members as well. 3) And the journey continues…. Where: Participants now meet monthly at The Elm Café, 303 Montreal Street (corner Mtl & Charles). When: Tues, May 1, 7:00-9:00 Always the 1st Tuesday night of each month. Following their normal 5pm close, the store will re-open their doors at 6:30, and a barista will be on hand throughout the evening to offer espresso drinks, tea, and bottled or canned drinks, along with a limited selection of baked goods and other fare. What: Cataraqui Canoe Club get-together including FKIH turtle display table and shoreline walk with Kenny Ruelland from Reptile and Amphibian Advocacy. NOTES: We are most grateful to Trailhead for this generous donation for the fun idea of including paddlers in our outreach to inform community members of all stripes about our amazing turtles. Also, Kenny knows of a turtle hibernaculum on the shore close to the canoe club. Come and find out where it is! 5) JANES’S WALKS! Fri, May 4 – Sun, May 6. Of special interest: Roger Healey will be leading a bicycle tour of the K&P Trail on Sat, May 5 at noon meeting at the entrance to Belle Park – followed by lunch at the Legion! Mary Farrar will be leading a walking tour of the Inner Harbour: Past, Present and Future starting in the Anglin Parking lot just north of OHIP at 4 pm, also on Sat May 5. All welcome. What: Cleaning up the trail from River St. to Quattrocchi’s. Thanks so much again to Kendra and Company for their valiant efforts to organize this. So very much appreciated – as always. Tons of amazing goodies from Bread and Butter Bakery and fruit from Quattrocchi’s as well as coffee from Kendra and friends. Where: Meeting at Rideau and River Sts. When: Starting at 9 am. NOTE: Thanks so much to Sustainable Kingston, the Kingston Rowing Club and others who worked hard last week during Pitch-In to clean up Doug Fluhrer Park and the shoreline. Great job! What: Sharing info about what we citizen scientist volunteers will be doing this summer. Volunteer opportunities for those interested. Info about this past winter activities and exciting future research possibilities. What: Walk ‘n’ Roll Kingston ATMP is guided by a high-level vision that reflects the City’s goals and priorities for achieving a 20 per cent active transportation mode share. Ian Semple, Manager of the City’s Transportation Services Department, states that after 18 months of review, analysis and public engagement, the City’s first Active Transportation Master Plan (ATMP) entitled ‘Walk ‘n Roll’ will be presented to the Environment, Infrastructure, and Transportation Policies Committee (EITP) on June 11, 2018. What: Grant Awards Ceremony where FKIH will be receiving a substantial grant. Yey! Details must be kept secret until then. All welcome! Exciting event in partnership with Ollin. Planning in process…. So far…. Opening Ceremony, Traditional Turtle Story Sharing, Educational Displays and Information about Turtles, Arts, Crafts, Games, & Face Painting, Turtle and Earth Songs in English, Spanish, and Nahuatl! More details coming in mid-May update! Want to get involved or support? Thanks so much Meghan Balogh for the great feature! What: Shoreline walk with Kenny Ruelland hoping to see turtles nesting, Indigenous Traditional Knowledge Keeper + displays of turtle artifacts, take home info, turtle craft for kids. All welcome! All welcome! Rain or shine! 14) Incredible video – Imagine our turtles experiencing this! 15) Those trees along the trail near Quattrocchi’s? A quay built on fill parallel to the shore. So Molly Brant Point is a jetty if it is true that it was built on a couple of sunken barges. And now Dave Love has just pointed out – Yes it is a jetty if you can dock against it. Or it’s a groyne if it’s there to limit erosion! Live and learn! “Hello Members and other interested folk! The Tribunal Hearing on the Capitol project is Done! I can now report to you that the OMB/Local Planning Appeal Tribunal hearing into the Capitol proposal is over. We certainly discovered that a ten-day hearing over three weeks is an exhausting endeavour. Following my report of the first week when our experts gave testimony, the second week involved the testimony of the experts retained by the developers. Our lawyer, in his cross examination of these witnesses, did a very good job. After their last witness, our side had a chance to call experts again, and our land use planner from Ottawa, Dennis Jacobs, took the stand. That left one day for closing arguments. The legal team – lawyer David Donnelly, and two committed articling students – worked so hard for us on this hearing, putting in very long days, and their efforts are to be commended. The Tribunal Chair, as I noted before, paid very close attention, and took many notes, so regardless of the resulting decision (which is not due for months) we feel that he gave us a fair hearing. So, the bills are now coming in, and again, to those of you who contributed already, thank you. If you have been hesitating to donate because you think we may not need the money – now is the time! Please send your cheque to our address P.O. 27, Kingston, ON K7L 4V6. Donations in excess of the regular membership fee will go towards the OMB challenge. Please mark your cheque accordingly. A special thank you to our members who also acted as participants in the hearing. Our community is very committed to protecting our historic core. As David Donnelly said in his closing argument, it was a first for him to have two former mayors speak out against a proposal. 20) Amazing Earth Day Celebration in Belle Park last weekend. The 3rd Annual Family friendly community celebration honouring Mother Earth! By Ollin.ca with first year partnership of Kingston National Indigenous Peoples Day Committee and support from Canadian Mental Health Association, Kingston Community Health Centres Special Events, Sustainable Kingston and more! Family friendly community celebration! international drumming performances, sacred fire with teachings, poets, community and vendor booths, educational and interactive activities plus more! Vendors, info booths, interactive activities, volunteers, and sponsors. Congrats to Brad Brennan for his great work on this front for young rowers. Bill 139 – The Building Better Communities and Conserving Watersheds Act, 2017. Also see Planner Paige Agnew’s Blog at: https://www.cityofkingston.ca/business/planning-and-development/blog/-/blogs/update-on-local-planning-appeal-tribunal?p_p_auth=52IwKCGx&_33_redirect=%2F. So there we are. This is what builds up when I don’t do a mid-month update!!! As always, thanks so very much for your interest. So very much appreciated.